The situation in Mosul is getting worse, this week I heard about so many murders, for people I know or people I heard about.. The strange thing which's happening now is, the terrorists kill the target with his relatives too, like his father, brothers, brothers-in-law, and nephews !!! And the other strange thing, when someone take an injured person to the hospital the policemen arrest him!! because he may be involved and question them, my friend saw a man full of blood, he was injured in the head and chest dragging himself and no one helped him. Last night, I stayed awake, I am suffering from insomnia, there are a lot of things I think about, and most of the days I don't sleep immediately I spend an hour or two laying till I sleep, I walked towards the window and was watching the neighborhood, it was dark (the electricity was off), empty, and scary, like a ghost city, and I started to remember how crowded my neighborhood and it's street were, I am glad I didn’t forget that, anyway I came back to my bed and there was sound of far shelling, after an hour or two, mortars erupted from the neighborhood , and we heard 3 near by explosions.. I had to look for a car to drive me to and fro college daily, I finally found one, and a classmate with a nearby house is coming with me.. Yesterday was the first day he was supposed to come and drive me to the university. I woke up at 6:40, he was supposed to come at about 7:30 when the roads to the university aren't very crowded. I got dressed and had my breakfast and decided to go online till it's time.. There was an explosion, then shooting. I left the computer. Dad went out and checked, the driver will have to use another road to get to our house, the street was blocked. I went outside waiting, it was time and they weren't there.. Helicopters were hovering above the house.. I called my classmate many times but the signal was very weak. When it finally rang she picked up and told me there were Americans searching the cars and she has to hang up.. At 7:45 she called saying they can't reach the house. Dad drove me to college, we had to drive over about 4 pavements, going through wreckage and severely damaged roads. I arrived to college at time.. my classmate about 20 minutes later, another classmate in the same neighborhood arrived 2 hours later. I spent the rest of the day sighing, and the road back hearing all the bad stories of death and killings I could stand to hear from my classmate. That's not what I call home.. We're really strangers in our country.. oh well, excuse me, I don't think "our" should be used anymore.. I'm not sure whose country it is, but it's not mine for sure. A classmate's brother was injured with a shrapnel and died on the first day of Eid. She came to college wearing black. We gave her our condolences. She started crying, my friend started crying with her.. We would've all started crying if it wasn't for that new lecturer who shouted at us for not going into the lab at time.. we all hate him now. She's the second classmate who lost her brother this year. The mainstream U.S. media continues its effective news blackout on Iraq security developments, with the remaining scant coverage devoted to partisan "Iraq policy" debate on the domestic front. And in this case, no news means good news for the average American, which explains why I often receive emails from ideologues asking me why I am not acknowledging that the "tide has turned" or that "we are winning" in Iraq. So, while I've not had much time lately to update the blog, and since virtually all Iraqi bloggers have left Iraq anyway, I'll point out a local Iraqi wire agency that is increasingly posting dispatches in English. Of course most of the content is still in Arabic, but at least you'll get a much better picture of the security situation in Iraq from what is available than what you get from American news outlets: Voices of Iraq. Iraq’s electricity system has been in shambles for nearly two decades, and power continues to be the country’s largest reconstruction challenge. It is also the common complaint that links all of Iraq. Despite the widespread violence, bombs and shootings do not affect every province - but the lack of electricity is a burden every Iraqi must bear. In the hour or so it took to write this report, for example, the power blacked out and returned five times in the Sulaimaniyah neighbourhood where IWPR is based. For outsiders, electricity may seem a trivial concern compared with the rest of Iraq’s problems. But the reality is that there is a lot of talk about megawatts, kilovolts and amperes among ordinary people, most of whom have no professional background in electricity but have become experts nonetheless. Power is a primary issue for Iraqis, one that the United States and Iraq’s national and local governments recognise is integral to the development of the country. Electricity has, in many ways, become Iraq’s most valued resource. The authorities in Iraqi Kurdistan have sought to deal with their power shortages by striking its own electricity provision deals, but locals have seen little benefit from them. In the north of Iraq, buildings are going up and oil wells are being drilled, while tens of thousands of Iraqi families escaping violence in the south have fled to Kurdish areas to set up businesses or find work. But Iraqi Kurdistan’s infrastructure cannot provide for the region’s four million population, never mind cope with the additional pressure of new businesses and residents. Electricity shortages are the main source of public dissatisfaction with the authorities in Erbil and Sulaimaniyah. The third Iraqi Kurdish province, Duhok, receives power from neighbouring Turkey and cuts are rare. Electricity supplies in Iraqi Kurdistan have been irregular ever since it broke away from Saddam Hussein’s Iraq to become a semi-autonomous region 16 years ago, leaving it cut off from the country’s power grid. Nearly two decades later, the KRG has made little headway in improving the electricity supply despite its high level of autonomy. The local authorities have promised for years that power provision will get better, but fed up residents say they will only believe it when they see it. Officials and local militia groups in the southern province of Karbala are siphoning off the province’s dwindling power supply, leaving residents to rely on private generators, say local people. “There are some terrorists who set off bombs, and there some are terrorists who steal, like those officials [who keep electricity for themselves],” said Ali Jafar, a 55-year-old resident of the Shia city’s al-Malimeen neighbourhood. The Iraqi government estimates it is only supplying about half the electricity to service the needs of the public and businesses across the country, which are demanding more power than ever before. In Karbala, the power runs for about two hours for every four hours of blackouts. Karbala governor Aqil Mamoud al-Khazali told IWPR that the province receives about one-third of the power it actually needs. Khazali estimated that Karbala province requires 250 megawatts per day, but receives no more than 70 megawatts for its 500,000 population, which has been swollen by an influx of people displaced by violence in other parts of the country. This week on War News Radio, in response to a December referendum on who will control the oil-rich city, the current Iraqi government is moving Kurds back to Kirkuk, and moving Arabs back to where they came from. And, shopping for food can be a dangerous errand for families in Baghdad. We hear about some of the ways Iraqis have found to shop safely. And, in Iraq 101, we learn about the origins of the PKK, the militant Kurdish group that’s pushing tensions with Turkey past the boiling point. Finally, in our A Day in the Life series, we hear the story of an Iraqi journalist. Listen now. Amid warnings that southern Iraq could erupt into civil war when British troops withdraw, Basra's chief of police has publicly admitted that his forces have been unable to clamp down on growing militia warfare in the city. In recent months, rival Shia factions have been battling for control of the city which is considered the second largest in the country and home to Iraq's only port. This makes the Basra a vital outlet to the Gulf for marine transportation of oil and fuel products – a lucrative prize for any political faction looking to consolidate its power in Baghdad. The Iraqi government has dismissed a US warning that Iraq's largest dam is at imminent risk of collapse and is threatening the lives of thousands. Spokesman Ali al-Dabbagh said US claims that Mosul Dam, in the country's north, was the most dangerous in the world were inaccurate and "totally untrue". Mr Dabbagh said it was under constant observation and regularly maintained. In May, the US told Iraq a catastrophic collapse could unleash a 20m (65ft) wave on Mosul, a city of 1.7 million. The warning was published on Tuesday in a report by the US Special Inspector General for Iraq Reconstruction (SIGIR), which said that the dam's foundations could give away at any moment. SIGIR found that a $27m (£13m) US-funded reconstruction project, recently begun to help shore up the dam, had made little or no progress. The Hakim-Sadr pact: A new era in Shiite politics? The recent “pact of honor” made by two of Iraq’s most influential Shiite clerics, Moqtada al-Sadr and Abdul Aziz al-Hakim—aimed at preventing violence and helping to maintain the “Islamic and national interest” of Iraq—appears to signal a significant shift toward stability in Iraq. The two leaders have pledged to enhance relations between their respective groups, merging media and cultural projects, and to refrain from launching negative propaganda against each other (Fars News Agency, October 6). Yet, more importantly, the pact calls for promotion of the legal-political order of post-Baathist Iraq, a major move that could give new life to Nuri al-Maliki’s government and curtail potential violence in the south. As the first official agreement between these two prominent leaders, the forged pact can also be recognized as a huge step in improving intra-Shiite relations. Not since the formation of the United Iraqi Alliance, which brought together a number of Shiite political parties under the spiritual leadership of Ayatollah Ali al-Sistani in 2003, has Shiite politics seen such a unified front. The Turkish army Wednesday said it killed 15 Kurdish separatists near the Iraqi border as Washington announced it was providing Ankara with intelligence on the rebels holed up in northern Iraq. The latest fighting in the Cudi mountains of Sirnak province came as the cabinet discussed possible economic sanctions against Iraq's autonomous Kurdish administration which Ankara accuses of tolerating the Kurdistan Workers' Party (PKK) rebels in its territory. Three soldiers were also killed in the clashes since Monday that saw Cobra helicopters and artillery pound PKK positions in the rugged hills, an army statement said. Troops were also chasing rebels in the eastern province of Bingol and the southern province of Hatay, near the border with Syria, after skirmishes a day earlier, the military said, without mentioning any casualties. Turkey has massed up to 100,000 troops along its border with Iraq, according to media reports, as it threatens military strikes on PKK bases in northern Iraq where, it says, the rebels enjoy safe haven and obtain weapons for attacks on Turkish soil. Washington is giving Turkey intelligence on Kurdish rebels hiding in Iraq and helping Ankara gain the "actionable" intelligence the Pentagon says is needed before any military strike, a Pentagon spokesman said on Wednesday. "We are assisting the Turks in their efforts to combat the PKK by supplying them with intelligence, lots of intelligence," said Pentagon press secretary Geoff Morrell. "The key for any sort of military response from the Turks or anyone else is having actionable intelligence and that's a pretty high standard, and we are making efforts to help them get actionable intelligence," he told reporters. "Actionable" intelligence refers to information that can be acted upon, such as information that pinpoints the location of a target for a military strike. Washington has urged Ankara to show restraint after attacks by rebels from Turkey's outlawed Kurdistan Workers Party (PKK), hiding in northern Iraq. Turkey, which has NATO's second biggest army, has deployed as many as 100,000 troops on the Iraqi border and warned it will launch a major incursion into northern Iraq against the PKK unless U.S. and Iraqi forces clamp down on the group. Just as U.S. air operations over Iraq have reached their highest level since the destruction of Fallujah in November 2004, with as many as 70 close air support missions flown on many days since October 1, a new Human Rights Report published by the United Nations Assistance Mission in Iraq has challenged the United States to stop killing civilians in illegal air strikes. The Human Rights Report for the second quarter of 2007 was long overdue, and was finally published on October 11. The report explains that it was modified following discussions with U.S. and Iraqi occupation authorities, and this appears to account for the long delay in its publication. The report makes it clear that U.S. air strikes in densely populated civilian areas are violations of international human rights law. A footnote to the section on "MNF military operations and the killing of civilians" explains, "Customary international humanitarian law demands that, as much as possible, military objectives must not be located within areas densely populated by civilians. The presence of individual combatants among a great number of civilians does not alter the civilian character of an area." UNAMI demands "that all credible allegations of unlawful killings by MNF (Multi National Force) forces be thoroughly, promptly and impartially investigated, and appropriate action taken against military personnel found to have used excessive or indiscriminate force" and adds that, "The initiation of investigation into such incidents, as well as their findings, should be made public." The UNAMI report provides the following details of 88 Iraqi civilians killed by air strikes, 15 civilians killed "in the context of raid and search operations" by U.S. ground forces and several incidents of torture and extra-judicial execution by members of Iraqi auxiliary forces under overall U.S. command. UNAMI investigated these incidents because a relative, a journalist or a local official brought each one to its attention. Without doubt, the U.S. Department of Defense is aware of many more killings of civilians by air strikes and ground operations, hence UNAMI's urgent demand for full public disclosure and investigation of all such killings. Why did we invade Iraq anyway? Lately, even Democratic candidates for president have been weighing in on why the U.S. must maintain a long-term, powerful military presence in Iraq. Hillary Clinton, for example, used phrases like protecting our “vital national security interests” and preventing Iraq from becoming a “petri dish for insurgents,” in a major policy statement. Barack Obama, in his most important speech on the subject, talked of “maintaining our influence” and allowing “our troops to strike directly at al Qaeda.” These arguments, like the constantly migrating justifications for invading Iraq, serially articulated by the Bush administration, manage to be vaguely plausible (with an emphasis on the “vaguely”) and also strangely inconsistent (with an emphasis on the “inconsistent”). That these justifications for invading, or remaining, are unsatisfying is hardly surprising, given the reluctance of American politicians to mention the approximately $10-$30 trillion of oil lurking just beneath the surface of the Iraq “debate” — and not much further beneath the surface of Iraqi soil. Obama, for example, did not mention oil at all in his speech, while Clinton mentioned it twice in passing. President Bush and his top officials and spokespeople have been just as reticent on the subject. Why then did the U.S. invade Iraq? Why is occupying Iraq so “vital” to those “national security interests” of ours? None of this makes sense if you don’t have the patience to drill a little beneath the surface – and into the past; if you don’t take into account that, as former Deputy Secretary of Defense Paul Wolfowitz once put it, Iraq “floats on a sea of oil”; and if you don’t consider the decades-long U.S. campaign to control, in some fashion, Middle East energy reservoirs. If not, then you can’t understand the incredible tenaciousness with which George W. Bush and his top officials have pursued their Iraqi dreams or why — now that those dreams are clearly so many nightmares — even the Democrats can’t give up the ghost. MNF-Iraq is reporting the deaths Three Multi-National Division - Center Soldiers in a roadside bombing in an southeast neighborhood of Baghdad on Tuesday, Oct. 30. #1: Diwaniya General Hospital received an unknown body that had been found by police forces in southeastern Diwaniya, a local medic said on Wednesday. #1: A policeman was injured seriously when gunmen opened fire attacking a police patrol in Eskandariyah city north of Babil city around 9,30 am. #1: A roadside bomb killed an off-duty soldier and a policeman and wounded one civilian when it exploded near their car on a main road near Tuz Khurmato, 180 km (110 miles) north of Baghdad, police said. Two policemen were killed and another was injured when an explosive charge went off near their civilian vehicle on Wednesday morning in the city of al-Azim, southwest of Kirkuk, a police source from the Touz Khormato police department said. #1: Gunmen wounded an intelligence officer along with his wife and son in a drive-by shooting in the northern city of Kirkuk, 250 km (155 miles) north of Baghdad, police said. #2: Dhahir al-Bayati, chief judge of Kirkuk Appeal Court, escaped an assassination attempt when gunmen opened fire at his car, killing one of his guards and seriously wounding another in the northern city of Kirkuk, 250 km (150 miles) north of Baghdad, police said. #3: A policeman was killed and two others injured when gunmen attacked one of the check points of Al Multaqa police station in Yaiji town northwest of Kirkuk city yesterday night. #4: Gunmen driving a fast car (grey Opel Sedan) opened fire targeting an employee with his two kids while he was talking them to their school in Al Baath neighborhood downtown Kirkuk city early morning today. The employee and his two kids were injured. Police took the employee and his kids to the hospital. #5: three people from the same family were shot dead in a US army raid on homes in the district of Wasiti in Kirkuk, 250 kilometres north of Baghdad, police and hospital sources told Deutsche Presse-Agentur dpa. There was no comment from the US military. #1: One civilian was killed by unknown gunmen in northeastern Mosul and another was wounded in an explosive charge attack in the north of the city, an official security source said on Wednesday. #2: another civilian was wounded when an explosive device went off in al-Arabi neighborhood in northern Mosul, the same source added. #3: On the Kirkuk-Mosul road, a member of a tribal council involved in a crackdown against the al-Qaeda terrorist network was killed and three others were injured when gunmen opened fire on their car. #1: The mayor of the city of al-Ratba, Anbar province, escaped an attempt on his life on Wednesday afternoon at the center of the city, eyewitnesses said. "Unknown gunmen opened fire at the motorcade of the Mayor of al-Ratba, Qassem Marei al-Kabessi, while passing by the center of the city, causing severe damage to one of the vehicles," an eyewitness told the independent news agency Voices of Iraq (VOI) over the phone. Another eyewitness said that "gunmen used automatic weapons in the attack, which followed by clashes between the gunmen from one side and police forces from the other." #1: Authorities in southern Afghanistan say Afghan and NATO-led forces have killed about 20 Taliban fighters during an operation near the city of Kandahar. The chief of police in Kandahar province, Sayed Agha Saqib, said another 25 Taliban fighters were wounded in the fighting around two villages in Arghandab district on Monday and Tuesday. He said Afghan and foreign troops did not suffer any casualties. The official said the military operation was launched after Taliban fighters captured several checkpoints in the area, following the death of a local pro-government tribal leader, Mullah Naqibullah, who had managed to keep the militants out of his district. Afghan, U.S. and Canadian troops have surrounded a pocket of some 250 Taliban fighters who have commandeered people's homes in villages just outside Afghanistan's major southern city, officials said Wednesday. Hundreds of Afghans _ their cars and tractors piled high with personal possessions _ were fleeing the battleground about 15 miles north of Kandahar city. The provincial police chief said the combined forces have killed some 50 Taliban in three days of fighting. Three police and one Afghan soldier have also died, Sayed Agha Saqib said. Photo: Residents walk to a local hospital as U.S. army soldiers with First Platoon, Headquarters and Headquarters Battery, 2-17 field artillery patrol in the mixed Shi'ite and Sunni neighborhood of Zafraniyah in Baghdad October 30, 2007. According to DPA, an Iraqi civilian was killed and another wounded Monday evening after a US military patrol opened fire on them in the Iraqi city of Kut, the capital of the province of Wasit south-east of Baghdad. The US troops fired at a civilian vehicle at an intersection in the district of Kafat, north of the city, killing the driver and critically injuring a passenger, police sources told Voices of Iraq (VOI) news agency. This incident had been preceded by a double US air strike in east and west Tikrit city, 180 kilometers north of Baghdad, killing 10 Iraqis and injuring a woman and two children. Iraqi security forces managed to set free a young woman seriously wounding two of her kidnappers and arresting the others during a late hour on Monday night, a security official said on Tuesday. "The girl was found and freed from her kidnappers, who were hiding her inside the trunk of their automobile, when they were stopped at a checkpoint on Muhammad al-Qassem street, the highway that links Baghdad to the southern provinces," Brig. Qassem Atta, the official spokesman for the Fardh al-Qanoon security plan, told the independent news agency Voices of Iraq (VOI). "The kidnappers tried to "open fire at our soldiers but security forces seriously wounded two of them, arrested the others and seized their vehicle," added Atta. The spread of cholera in Iraq is slowing thanks to health measures taken to curb an outbreak of the disease, the health ministry said on Tuesday. Cholera has killed 22 people since an outbreak in the northern province of Kirkuk in August and there have been 4,444 confirmed cases, almost exclusively in northern regions. "The rate of increase is very slow. October was better than September. Thanks to the monitoring of the disease and health awareness campaigns among citizens the situation has became better," a health ministry spokeswoman said. Cholera is characterised in its most severe form by a sudden onset of acute watery diarrhoea that can cause death by severe dehydration and kidney failure within hours. The virulent disease is mainly transmitted through water and food. With 2,968 cases and five deaths, Kirkuk province has been the epicentre of the outbreak. In neighbouring Sulaimaniya, 14 people have died and 1,217 cases have been recorded. In nearby Arbil province there have been 224 cases, the spokeswoman said. Health officials in Kirkuk said on Tuesday they were still monitoring places such as restaurants and water sources to try and prevent cholera making a comeback. The editor of a Baghdad weekly newspaper was murdered at the weekend, Iraq's Journalistic Freedoms Observatory said on Tuesday. The Iraqi non-governmental organisation said Shehab Mohammed al-Hiti, a Sunni Arab editor of the al-Youm newspaper, was last seen leaving his home in the western Baghdad neighbourhood of Jamiaa on Saturday. He was heading for the newspaper's office in the centre of the capital. Iraqi security forces found his body later that day in the northern Baghdad district of Ur, which is a Shi'ite neighbourhood. In a statement the Journalistic Freedoms Observatory did not say how he had been killed. Many journalists in Iraq have faced threats from Sunni Arab militants and Shi'ite militias. Others have been killed by U.S. forces while reporting in the country. 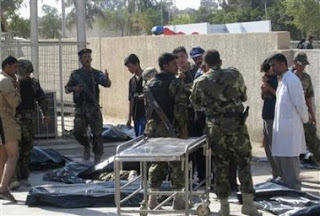 Seventeen Iraqis were killed Sep. 16, and another 27 wounded at Nisoor square in western Baghdad when mercenaries from the company opened fire on them. Dozens of witnesses said that, contrary to Blackwater claims, the mercenaries had not come under attack. Several Kurds who were at the scene said they saw no one firing at the mercenaries at any time, an observation corroborated by forensic evidence. Kurds are one ethnic group that has been supportive of the U.S.-led invasion and occupation of Iraq. The Kurd witnesses work for a political party whose building looks directly down on the square where the bloodshed occurred. "I call it a massacre," Omar H. Waso, a senior official from the Patriotic Union of Kurdistan told reporters. "It is illegal. They used the law of the jungle." "Some of the victims were Iraqis who were close to the government," an eyewitness speaking on condition of anonymity told IPS. "There was a notable fuss about five or six bodies in particular when the ministry of interior's inspectors arrived on the scene." The history of western mercenary companies, often referred to as "security contractors", is full of such stories. "They killed my young neighbour Sinan in cold blood," a 32-year-old using the name Ibrahim Obeidy told IPS. "They have killed so many Iraqis, and no one can even ask them why." "Iraqis in Anbar province (to the west of Baghdad) have always said that strange-looking forces have conducted executions in cold blood," Abdul-Sattar Ahmed, a lawyer from province capital Ramadi told IPS. "Groups of men in civilian outfits, but in armoured vehicles and sometimes helicopters, have carried out the most mysterious executions. They seldom arrest, they prefer to kill." Salih Aziz who works with the Iraqi Group for Human Rights, an NGO in Baghdad, told IPS that Blackwater convoys, which usually comprise several large, white SUVs, have proven deadly for Iraqi civilians since the early months of the occupation in March 2003. "Since the very beginning of the U.S. occupation of Iraq, Baghdad streets have seen peculiar looking groups of men in armoured cars with black glasses, killing anyone who approached them," said Aziz. "They were the first to be hated by Iraqis." Several Iraqi power plants are idle due to shortages in fuel supplies, exacerbating blackouts across the country. Electricity Minister Kareem Waheed blamed the stoppages on lack of fuel, saying neighboring countries have failed to honor contracts to ship fuel supplies. Iraq, sleeping on massive oil reserves, currently imports most of its fuel needs and the fuel import bill has surged to hundreds of millions of dollars a year. Iraqi refineries have the capacity to churn out up to 700,000 barrels a day but they are working much below capacity due to acts of sabotage, lack of maintenance and corruption. Waheed’s target in Kuwait is to persuade Kuwaiti authorities to sign a new fuel import contract as domestic fuel production is dwindling, electricity ministry officials said. They said several power plants were idle because there was no fuel to operate them. The largest dam in Iraq is in serious danger of an imminent collapse that could unleash a trillion-gallon wave of water, possibly killing thousands of people and flooding two of the largest cities in the country, according to new assessments by the U.S. Army Corps of Engineers and other U.S. officials. Even in a country gripped by daily bloodshed, the possibility of a catastrophic failure of the Mosul Dam has alarmed American officials, who have concluded that it could lead to as many as 500,000 civilian deaths by drowning Mosul under 65 feet of water and parts of Baghdad under 15 feet, said Abdulkhalik Thanoon Ayoub, the dam manager. "The Mosul dam is judged to have an unacceptable annual failure probability," in the dry wording of an Army Corps of Engineers draft report. At the same time, a U.S. reconstruction project to help shore up the dam in northern Iraq has been marred by incompetence and mismanagement, according to Iraqi officials and a report by a U.S. oversight agency to be released Tuesday. The reconstruction project, worth at least $27 million, was not intended to be a permanent solution to the dam's deficiencies. Hundreds of people in the district of al-Khalis, 15 km north of Baaquba, staged a demonstration on Tuesday morning demanding the release of a Muslim preacher and others arrested with him by U.S. forces on Saturday, a notable in Khalis said. "The march, which started from central Khalis and went in the direction of the mayor's building, called for the release of Sheikh Nazem al-Nusayrawi, the imam and preacher of the Grand Mosque in Khalis, and others who were arrested with him on Saturday," Sheikh Muhammad al-Saadi told the independent news agency Voices of Iraq (VOI). A security source had told VOI on Saturday that U.S. forces landed in al-Khalis killed two policemen "suspected of belonging to armed militias." No statements or comments were made by the U.S. side in this respect. "I have handed a memo signed in the name of the protesters to a U.S. commander demanding compensations for the martyrs' families, the immediate release of the detainees and stopping raids and searches in safe areas," Saadi told VOI. After the November 2004 battle that pulverized the city and snuffed out what was left of its economy, a succession of American infantry units developed a security plan for Fallujah that eventually carved it up into nine precincts along traditional divisions. The districts are now separated from each other by concrete barricades and Iraqi police checkpoints and watched by thousands of Iraqi police and armed neighborhood watchmen, leading to the nickname "Fortress Fallujah." "It's an unfortunate side effect of securing the city," Miller explained, reminding his Iraqi partners that the main drag through the city, which used to feed the district its lifeblood of customers and commercial traffic, is also part of the traditional "rat line" or infiltration route for insurgents. With a current driving ban limiting traffic on the road mostly to buses and taxis, it will be some time before Fallujah allows full access to Sinaa. Eventually, the plan is to tear down the barriers one at a time to allow the city to gradually return to normal and end the state of martial law. Doing that in Sinaa could jump start Fallujah's economy and revive a general sense of well being and promise, solidifying gains and allowing the Marines to finally leave. "It's the key," said Waleed al Fallujy, Sinaa's mukhtar, or neighborhood chief, and charter member of the Fallujah Chamber of Commerce. "If we fix Sinaa, we fix all of Fallujah," he said. While Al Qaeda remains the Americans' chief hang-up, locals say security is only one of their obstacles. The government in Baghdad stunts Fallujah's growth as much as Al Qaeda. After the two massive U.S. attacks on Fallujah in 2004, the government commission set up to assess damage and calculate compensation for residents and business owners. The commission, however, fixated on some issues and dropped the ball on others, making some residents rich while leaving others empty-handed and disgruntled. Over the summer, rarely a day passed without a car bomb going off near the neighborhood where Hussein Faleh has persevered through the worst days in Baghdad. Since 2004, he's kept The Vanilla Pastry Shop open – and filled with some of the best raspberry-kiwi tarts and hazelnut-chocolate cakes in Iraq. Although Jadriyah has always been safer than most areas in the city (it sits across the river from the fortified Green Zone and is home to both Iraqi and US officials), Mr. Faleh says that in recent weeks he has seen the fruits of improved security throughout Baghdad. His story is one of dogged persistence in the face of adversity, and it's now paying off. More of his customers – the ones who haven't joined the millions who've fled to neighboring Jordan or Syria – are venturing back for his famous pastries and slices of cake that sell for up to 1,750 dinars ($1.50), about three times the price charged by a typical bakery in the capital. This month, according to Iraq's Interior Ministry, Iraq is set to post the lowest death toll in 18 months. The ministry said Monday that violence throughout the country has dropped 70 percent since June, when the US completed its surge of troops. So far this month, according to state numbers, 285 Iraqis have been killed. In January, that number topped 1,992. But the demand from Iraqis, traditionally known as bird-lovers, has not dried up and they are willing to pay a high price for rare species. "The price of a parrot depends on its ability to speak. Some may utter 50 words and another 500. Such a bird can fetch up to 2,000 dollars," says Casco. But the high price does not discourage enthusiasts. "I already have two in my house," says Mohammed Arshad, a student of natural sciences. "One is from Africa and one from Brazil." The young man has used the Internet to learn how to make the birds talk and now claims to be a "real professional." "I am now looking for another parrot to teach as I taught the other two. Those who take to this passion can't live without it." But in these troubled days where Baghdad is still reluctant to believe that the relative calm in recent weeks may last permanently, buyers quickly disperse after their purchases. In March, three explosions rocked the neighbourhood killing and wounding dozens of people. The past few months have, however, seen a dip in the violence, though not enough to make Baghdadis venture out for long. Though he is not nostalgic about the former regime, Casco can not help but regret the relative calm under Saddam. "Even the officials came to buy birds. I remember that one of them wanted a parrot who could sing the praises of the president," he said. "In three days I taught a bird a song glorifying Saddam and offered it to the official who wanted to present it to the president." But times have changed. Casco points a finger to a group of animals and suddenly an African Grey parrot -- a new arrival -- shouts out "Down with Bush!" It had to be done quickly. Rogue Shiite militiamen were holding hostage a group of Sunni and Shiite tribal sheiks who had joined a revolt against al-Qaida. For the Iraqi government and its U.S. backers, the seven men represented a rare symbol of national unity. A daring rescue operation secured their freedom. A meeting Tuesday between most of the former captives and military officials - including the Iraqi commander of the rescue operation - offered the first detailed picture of the tense and fast-moving events: the kidnapping, the slaying of one captive and the seven-hour rescue mission Monday converging on an area that was "not fit for rats." The sheiks, recounting their 30-hour ordeal to a small group of reporters including The Associated Press, said they were tortured and humiliated. At least three of the sheiks were visibly bruised. One man's left eye was red and swollen. The two others had bruises on their backs, arms and legs. But they insisted that they emerged from captivity more determined than ever to continue their fight. It was the third time Nouri al-Maliki had tried to fill some of the empty posts in a bid to foster national reconciliation and rebuild his cabinet. According to Reuters parliament approved on Tuesday the appointment of Saleh al-Hasnawi as health minister and Ali al-Bahadeli as agriculture minister. The posts were previously held by Sadrists, politicians loyal to prominent Shia cleric Moqtada al-Sadr who quit the government in April in protest at Maliki's refusal to set a timetable for US troops' withdrawal from Iraq. The appointments mean Maliki has filled two of the six cabinet posts left vacant by the Sadr group. However, the Prime Minister has indicated he will not replace three other Sadrist ministers, leaving just one post to fill. The official spokesman for the Diala Salvation Council said on Tuesday that the irrigation minister of what is called the Islamic State of Iraq armed group was killed by his son over loot division, south of Baaquba. "Shalal Youssef Zidan, the irrigation minister of the al-Qaeda's Islamic State of Iraq armed group, was killed on Tuesday afternoon in Abu Khamis village in Bahraz district, south of Baaquba, by his son over loot division," Sheikh Sabah Shukr told the independent news agency Voices of Iraq (VOI). "Zidan was hit by several gunshots to several parts of his body after differences with his son over loot division," he also said, providing no more details. For his part, an official source in Dial confirmed the death of Zidan. "Zidan was included in a list of wanted men," the source added. Iraq's cabinet approved a draft law on Tuesday to end foreign security firms' immunity from prosecution by scrapping a controversial decree that Iraqis say amounts to a "licence to kill". The bill, which has to be approved by parliament, follows a Sept. 16 shooting incident involving Blackwater in which 17 Iraqis were killed. The U.S. security firm said its guards acted lawfully, but the shooting enraged the Iraqi government. In Washington, a U.S. government official said efforts to bring charges in U.S. courts could be complicated by an offer of limited immunity to Blackwater security guards by State Department investigators. The New York Times said the investigators did not have the authority to make such an offer. "The cabinet has approved a law that will put non-Iraqi firms and those they employ under Iraqi law," Iraqi government spokesman Ali al-Dabbagh told Reuters after a cabinet meeting. Iraq says there are more than 180 mainly U.S. and European security companies in Iraq, with estimates of the number of private contractors ranging from 25,000 to 48,000. Prominent Democrats in Congress reacted angrily today to disclosures that State Department investigators made apparently unauthorized offers of immunity to Blackwater security guards in the case of last month's deadly shooting of 17 Iraqi civilians. Calling the offers of immunity "an egregious misjudgment," Representative Henry A. Waxman of California wrote Secretary of State Condoleezza Rice and demanded details about the offers, which he said "raises serious questions about who conferred the immunity, who approved it at the State Department, and what their motives were." Most of the guards who took part in the episode were offered what officials described as limited-use immunity, which means that they were promised they would not be prosecuted for anything they said in their interviews with the authorities as long as their statements were true. Some government officials are calling these offers of immunity a potentially serious investigative misstep that could complicate efforts to prosecute the company's employees involved in the episode. Senator Patrick J. Leahy of Vermont, the chairman of the Senate Judiciary Committee and head of the appropriations subcommittee that has budget jurisdiction over the State Department, also issued an angry statement. "In this administration, accountability goes by the boards," he said. "If you get caught, they will give you immunity. If you get convicted, they will commute your sentence." Acrassicauda, which claims to be Baghdad's only heavy metal band, fled to Syria and on to Turkey to avoid the violence in Iraq and specific death threats from insurgent groups, but now the four young musicians may be forced to return home. "We're stuck, we're lost," Marwan, at 23 the youngest member of the group, said by telephone from Istanbul where he is staying with bandmates Firas, Tony and Faisal. He said the musicians were not welcome in Turkey, particularly since fighting has escalated between Turkish forces and Kurdish rebels near the Iraqi border, but they could not find another country willing to take them in as refugees. "If we ever made it back to Baghdad, and we ever made it back to our families, where would we rehearse?" said Marwan, frustrated at talking about politics and personal troubles rather than tours and tracklists. "If we go back to Baghdad now, we'll just stay at home as prisoners, not even go out to buy and packet of cigarettes. "I live in a Shi'ite neighborhood and I'm a Sunni," he added, referring to sectarian divisions behind much of the killing. "There are gangs who deny us the simple choice of free will." American officials report that the number of sectarian and other killings in Iraq has declined since the onset of the military "surge" that began earlier this year. But while the number of killings may, indeed, have fallen, does that mean Iraq is really safer? Insecurity in Iraq is most strikingly illustrated by the number of people fleeing their homes. The United Nations estimates that, since July, the number has risen by 60,000 every month. The best estimate is that around 16 percent of Iraq's population, or one in six Iraqis, no longer live in their homes. …. Mixed neighborhoods across Iraq have been targeted by one side or another as sectarian violence has risen and local militias wield power. The inability of the government or the multinational force to curb this intimidation reflects the absence of the rule of law. Other factors causing displacement include operations of the multinational force itself, crime, the lack of basic services and desperate poverty. The complexity of Iraq's society and history means that many people have been displaced more than once, or have returned from exile only to become internally displaced. According to the U.N., 69 percent of those displaced since February 2006 come from Baghdad, which demonstrates the extent of the "sectarianization" of the capital. Thus, one reason for the "success" claimed by supporters of the military surge may well be that sectarian cleansing in Baghdad has been hugely effective and is now nearly complete. Today Iraq has 1/3 of the doctors it needs. Those who remained, are daily harassed by armed militias storming into their clinics. Some have closed shop and work from home instead. The Health Ministry has a DELIBERATE policy of not providing Hospitals in the Sunnis areas with funds, equipment, medicine and staff. This is a deliberate act that falls in perfect line with the overall sectarian nature of the puppet government. Another way of furthering the smaller genocide within the grander genocide. 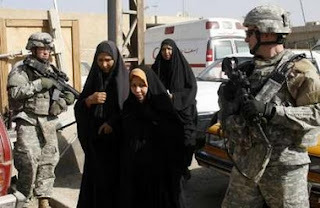 The Iranian genocide against the Sunnis within the grander American genocide against the Iraqis. The same applies to the Ministries of Works, Transport, Interior, Education, etc...But I will leave those out for the moment as I really want you to focus on the “Health Service” disaster that is now the norm in Iraq. I will not even start mentioning the rampant diseases that we had ERADICATED before our “Liberation,” now making a comeback. Cholera, Typhoid, Malaria, T.B, Hepatitis, Dysentery, Polio and AIDS. This latter was virtually unheard of in Iraq. I will not even go through the cancer cases in particular soft tissues and blood cancer that have been multiplied by 600 thanks to D.U. This alone is a tragedy in itself. And will not cover other common illnesses such as heart disease, diabetes, hypertension for which people can’t find adequate treatment and can’t afford the medication either. Nor will I touch upon the very serious mental health degradation of the majority of Iraqis. An ongoing PTSD with no end in sight. Nor will I mention the lack of pre-natal and post-natal care. Nor the forced ceasarians before their terms. Nor the increasing number of miscarriages. Nor the infants who do not stand a chance of seeing the light of day. Nor the children dying in loads...No, I will not mention any of that. The current Health situation in Iraq is a tragedy of monumental proportions. It is yet another crime that both the U.S and the Iranian puppet government in Baghdad have committed. Who holds the American card in Iraq? It is not difficult for any analyst to find out how the U.S. tried to ally itself with almost all Iraqi factions with their different hues in the past five years. The alliance with these parties has usually come as they were seen by the U.S. to be at the apex of their power. The ultimate aim has been to appease almost everybody as a means to extricate itself from the Iraqi debacle. Initially, the U.S. implicated itself in the woes of the ethnic and sectarian strife in Iraq by siding and backing one particular group against the other. This policy continued while at least one important part of the country was burning. And not long ago, it realized it had to extend a helping hand to opposite groups, too. So it is clear now that the U.S. is not sympathetic to one sect only. It wants to have a foot in the disparate worlds of Iraq’s uncompromising sectarian, tribal and political factions. Even the groups resisting U.S. presence in the country have come to realize that almost everyone in Iraq now relies on U.S. assistance to maintain its share of power and influence. Therefore, Iraqi resistance has wisely chosen to ignore the Iraqi government and any other group whose existence depends on America. If they wan to talk, these groups say, they will only talk to the U.S. This shows that both friend and foe in Iraq see the U.S. as the common denominator. Without U.S. occupation troops, the government cannot survive. The tribes now need U.S. support to maintain the surge in their standing, influence and power. Resistance groups need to talk to the U.S. and explore a diplomatic and political avenue to achieve their target of driving its occupation troops without shedding more blood. Kevin Zeese: Compare your experiences in Iraq with how the media generally described the events. Do you think most people, Americans in particular, are getting an accurate picture of what has occurred in Iraq? Is occurring in Iraq? Dahr Jamal: From the invasion until now, with few exceptions the so-called mainstream media in the West has portrayed a drastically different picture of what Iraq is really like under U.S. military rule. We regularly see stories from the military point of view, and rarely, if ever, how catastrophic the occupation has made life for the average Iraqi. Thus, most people are in no way getting an accurate picture of what has occurred, or what is occurring today. For example, how many mainstream outlets cite the only scientific survey which has been done to tally the number of Iraqis killed? Known as the Lancet report, and conducted by scientists from John's Hopkins Bloomberg School of Health in conjunction with Iraqi doctors from al-Mustanceriya University in Baghdad, it found that 655,000 Iraqis had died as the direct result of the U.S.-led invasion and occupation. Over 90 percent of the people they tracked had death certificates provided by family members to the researchers. Yet the mainstream media does not cite this survey, which was authenticated by British Government. Why not? This is but one example of countless examples. Zeese: You were in Fallujah, describe how long, when and under what circumstances. I understand you were there right after the four Blackwater operatives were killed in Fallujah? I've heard commentators describe the U.S. role in Fallujah in heroic terms, like something out of a World War II movie. How do you see the role of the U.S. military in Fallujah? Jamail: I went into Fallujah several times; first-before the siege to see that the military had an ongoing policy of collectively punishing the cities residents by cutting water and electricity everytime they were attacked. Then during April I went as the siege was in progress. After the siege ended I returned several times in May to chronicle what happened. Later, during the November siege, I covered it by interviewing doctors and refugees from the city. What the U.S. military did in that city, under orders from the White House, likens it to a modern Guernica. Most of the city was destroyed during the second attack-70% of it was destroyed. Restricted and illegal weapons like cluster bombs and white phosphorous were used by the military. Marine snipers were shooting anything that moved in the city. #1: In 2006, there were 386 sniper attacks on coalition forces, according to data from the Multi-National Force-Iraq headquarters in Iraq. Through Oct. 26 of this year, there were 269 sniper attacks, the figures show. However, the rate of sniper attacks has dropped slightly in 2007 and fallen dramatically in the past four months, according to military records given to USA TODAY. #2: The editor of a Baghdad weekly newspaper was murdered at the weekend, Iraq's Journalistic Freedoms Observatory said on Tuesday. The Iraqi non-governmental organization said Shehab Mohammed al-Hiti, a Sunni Arab editor of the al-Youm newspaper, was last seen leaving his home in the western Baghdad neighborhood of Jamiaa on Saturday. He was heading for the newspaper's office in the centre of the capital. Iraqi security forces found his body later that day in the northern Baghdad district of Ur, which is a Shi'ite neighborhood. In a statement the Journalistic Freedoms Observatory did not say how he had been killed. #3: a civilian was killed and another wounded Monday evening when a US patrol fired at them in the centre of the city of Kut, the capital of the province of Wasit south-east of Baghdad, police sources were quoted as saying by VOI. "A US patrol, which was driving through the streets of Kut, fired at a civilian vehicle Monday evening at an intersection in the district of Kafat, north of the city, killing the driver and critically injuring a passenger," the sources said. #4: From the invasion in March 2003 through Oct. 1, 2007, more than 36,000 U.S. troops were evacuated from Iraq. More than 77 percent of the evacuations were for illnesses or noncombat injuries, according to data from the Department of Defense, Deployment Health Support Directorate. #5: A bomb inside a minibus wounded two people on a highway in eastern Baghdad, police said. #6: Two policemen were wounded when a mortar round landed in the Mansour district of western Baghdad, police said. #7: A militant killed one street cleaner and wounded six others when he threw a hand grenade at their vehicle in eastern Baghdad's Zayouna neighbourhood, police said. #8: Four bodies were found in different districts of Baghdad on Monday, police said. #9: A bomb in a minibus killed one person and wounded four others in the central Baghdad Alawi bus terminal, police said. #10: U.S. forces killed four suspected militants and detained 17 in operations on Monday and Tuesday targeting al Qaeda in central and northern Iraq, the U.S. military said. #1: Gunmen killed a police lieutenant on Monday in the holy city of Najaf, 160 km (100 miles) south of Baghdad, police said. #2: Meanwhile, unidentified gunmen shot down a policeman from Najaf police force at an early hour on Tuesday morning in al-Abbasiya district in the east of the city, the same source indicated. #1: Four policemen were killed and eight others wounded when a car bomb exploded near their patrol in Samarra, 100 km (60 miles) north of Baghdad, police said. #1: A body was found shot and tortured on Monday night near the city of Kirkuk, police said. #2: Gunmen killed an off-duty policeman in a drive-by shooting in central Kirkuk, police said. #1: Police said they found four bodies in the northern city of Mosul. #1: An American soldier was killed and another wounded in a firefight with the Taliban this morning near Sperwan Ghar in Kandahar province. Canadian Forces Captain Josee Bilodeau said the victims were members of the embedded training team that mentors members of the Afghan National Army. She said the team was attacked by an unknown number of insurgents and that an Afghan soldier was also slightly injured in the ensuing firefight. An intelligence chief and three of his men were killed Tuesday by a roadside mine in eastern Afghanistan. The head of intelligence for the Qarghai district of Laghman province was killed when a newly planted mine blew up his vehicle, said Nezamuddin Nezam, spokesman for the provincial governor. The incident occurred when he and the three agents was travelling from the district to the provincial capital of Mihtarlam, Nezam said, adding that police units were sent to the area to investigate. An Iraqi editor was slain in Baghdad, the Committee to Protect Journalists announced Monday, raising to at least 122 the number of journalists killed in Iraq since the war started in March 2003. Shehab Mohammad al-Hiti was a 27-year-old editor for the fledgling weekly Baghdad al-Youm, which had been publishing for only three weeks. He disappeared Sunday after he left his home in western Baghdad to go to work, the New York-based advocacy organization reported, citing a source at the newspaper. Iraqi security forces found the journalist's body later that afternoon, it said. About 85 percent of media deaths in the war have been Iraqis, according to the group. Two Iraqis were killed and 10 others wounded in two separate US airstrikes Monday on the northern city of Tikrit city, an Iraqi police source said. A US aircraft jolted the Abu Obeid area in west Tikrit killing two Iraqis and injuring seven others, Colonel Ahmed Hasan from Salahaddin province police department said. Shortly afterwards, another US airstrike hit Albo'jail district in east Tikrit injuring a woman and two children, Hassan added. The reason for the two airstrikes, according to the source, is still unknown. Early in the morning on Oct. 4, American commando helicopters landed next to the village of Jaisani, a remote farming area just north of Baghdad. They were after a suspected weapons trafficker with ties to Iran. Within an hour, more than two dozen Iraqis inside the village were dead or dying. A U.S. military press release called the dead "criminals" and "terrorists." Now several Iraqi eyewitnesses say that the intelligence was false — and that those killed, including three women, were innocent. That morning, the men at the village checkpoint peered into the pre-dawn darkness. There was something out there — about 30 yards away. It was clear, said one eyewitness, that a ghost was moving. Thamer Mahdi Al Bayati, a 35-year-old engineer, was at the checkpoint. That morning, he was certain that al-Qaida in Iraq was again attacking his Shiite village. "The guard shot two rounds at the ghost. The ghost responded by throwing a hand grenade at the checkpoint," Al Bayati says. "Then heavy fire opened up at the checkpoint—machine guns and rocket-propelled grenades." Men dashed from their houses to the east side of the village, desperate to reinforce the checkpoint. The women and children ran to the west toward what they thought was safe ground. When the Iraqi National Symphony Orchestra (INSO) holds a concert in Baghdad, organisers don't like to advertise: in fact they would prefer as few people as possible know about it. Welcome to the bravest orchestra in the world. The INSO, established in 1959, has survived decades of war, international sanctions, government neglect and vicious sectarian violence that has killed tens of thousands of Iraqis and forced millions to flee for their lives. It saw its music library and instrument store looted after the U.S.-led invasion to topple Saddam Hussein in 2003, and one of its main concert venues was destroyed by U.S. missiles. Some members have been kidnapped or killed in sectarian violence, others have received death threats and 29 have joined the exodus of more than 2 million people who have fled Iraq. But amid the discord, the orchestra seeks harmony. Its 60 members are an ethnic and religious cross-section of Iraqi society -- Shi'ite, Sunni Muslim and Christian, and Arab, Kurd and Turkman. They see themselves as a family of survivors. So it was with pride that the orchestra launched into Johann Strauss's 'Blue Danube' to kick off the first concert of their new season, held on a Thursday afternoon at a social club in the western Baghdad district of Mansour, for an audience of invited guests. They use aliases and keep no business address. Only their immediate family members know what they do. This is the secretive world of Iraqis who work for private aid groups - and feel constant danger from extremists whose targets include Western agencies and their local staff. "We are the people who do good but, like thieves, we work in the dark," said George, an Iraqi running logistics for a group that assists needy Iraqi women. "The thieves, on the other hand, walk the streets with a swagger. No one dares mess with them." He agreed to speak to The Associated Press on condition that he be identified only by his first name. He also refused to be photographed and said his Western aid organization could not be named. The grim irony - humanitarian workers living in fear for offering help - highlights the insecurities facing nearly any endeavor in Iraq. Often, the perils are elevated for local staff who must commute to guarded compounds. Ahmad Chalabi, the controversial, ubiquitous Iraqi politician and one-time Bush administration favorite, has re-emerged as a central figure in the latest U.S. strategy for Iraq. His latest job: To press Iraq's central government to use early security gains from the surge to deliver better electricity, health, education and local security services to Baghdad neighborhoods. That's the next phase of the surge plan. Until now, the U.S. military, various militias, insurgents and some U.S. backed groups have provided those services without great success.That the U.S. and Iraqi officials are again turning to Chalabi, this time to restore life to Baghdad neighborhoods, speaks to his resiliency in this nascent government. It's also, some say, his latest effort to promote himself as a true national advocate for everyday Iraqis. Again we return to what called Democracy and its definition in language and on the ground. At least I wonder about its meaning in country like Iraq. What it is mean for Iraqi people and for the Iraqi government? Every day we heard about the tragedy stories that happen here and there in under the tent of Democracy. Four years passed and Iraqi people suffer all kinds of tragedies that became part of their new Democratic life … four years and Iraqi people lose their beloved for nothing ...Oh sorry, for democracy’s sake. We got rid of Saddam … Yes, but we still live with same kind of tragedy that reminded us of former regime’s crushing forces. 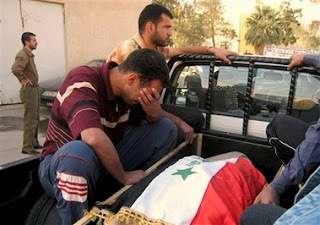 The tragedy of today is committed by Iraqis themselves who killed their brother in cold blood…. May be I use this phrase a lot in my blogs (cold blood)….. Sorry but we are forced to use it because it has good relationship with the tragedies that we live in tragedy of blood. Today morning when I was reading the wires’ news I saw a picture of Iraqi child who was killed in southern governorate. The child killed by hand of Iraqi policemen (according to the site). Those Iraqis (sorry may be I shouldn’t name them as Iraqis because their loyalty not for but to their Parties) were looking for the child’s father who was accused of belonging to militia. The attackers stormed his house but they couldn’t find the father that provoked their anger against the innocent family. This anger resulted of killing the two children and the wife who struggle death in hospital. Education specialists in Iraq are worried about the low school attendance of girls as it could create a huge educational gap. “The fear of losing their children through violence has led many families to keep their children at home but the number of girls kept at home is higher because in addition to the security problem, they are being forced by their families to assist in household chores,” said Sinan Zuhair, a media officer for the Ministry of Labour and Social Affairs. “Many families have lost their fathers or mothers and girls are asked to stay at home to help to cook, wash and clean. They are the ones paying the price of the violence since they have to forget about their future to be able to help the lives of their brothers,” Zuhair told IRIN. “The problem is worse in the rural areas where religion is being used by fathers as an excuse to justify why their daughters no longer attend school.” According to Mustafa Jaboury, a spokesman for the Ministry of Education, in the southern provinces, the ratio of girls attending school has dropped from two girls to three boys to one to four. Getting married in Iraq is turning into a dream for the would-be brides and grooms as they are facing two massive difficulties - a lean purse and sectarian confrontation. "It is very difficult to get married in Iraq nowadays because of the economic situation and the soaring cost," said 34-year-old Hussein Ali, an employee at the Ministry of Education. Nowadays, an ordinary wedding costs at least $2,400 dollars (3 million Iraqi dinars), which is a considerable sum of money for Ali, who earns $300 a month. According to traditions, the groom and his family bear the expenses of the marriage, covering the wedding party, furniture, in addition to clothes and jewels, which should be given to the bride ahead of the wedding. "It is not easy for both women and men waiting for proposals, to afford for an expensive dowry, house and the daily costs of sustaining a family," said Ali, confessing that he could not muster enough courageous to propose his girlfriend due to his poor economic condition. "Thinking about marriage is just like thinking about living in the hell," he grumbled. Iraqi security forces release eight out of the eleven tribal leaders kidnapped from their cars in Baghdad, an Iraqi official says. According to Iraq's Defense Ministry spokesman Maj. Gen. Mohammed al-Askari, Iraqi security forces rescued them on Monday after fierce clashes with their captives. "We have rescued eight of the hostages and are working to free the others. We killed four of the kidnappers," he said. The Sunni and Shia tribal leaders from Diyala Province who had joined forces against al-Qaeda in Iraq were abducted Sunday as they were traveling home after a meeting with a government official in Baghdad. Police said late Sunday they had found the bullet-riddled body of one of the sheiks, Mishaan Hilan, about 50 meters (yards) away from where the ambush took place. The US State Department promises Blackwater bodyguards immunity in its investigation into the massacre of Iraqi civilians by the firm. "Once you give immunity, you can't take it away," a senior law enforcement official familiar with the investigation told AP. That means it's possible no criminal charges will be brought, or, if they are, it may take months. Three senior law enforcement officials were quoted by AP as saying that all the Blackwater bodyguards involved were given the legal protections as investigators from the Bureau of Diplomatic Security sought to find out what happened. The bureau is an arm of the State Department. The investigative misstep comes in the wake of already-strained relations between the United States and Iraq, which is demanding the right to launch its own prosecution of the Blackwater bodyguards. When the U.S. military command accused the Iranian Quds Force last January of providing the armour-piercing EFPs (explosively formed penetrators) that were killing U.S. troops, it knew that Iraqi machine shops had been producing their own EFPs for years, a review of the historical record of evidence on EFPs in Iraq shows. The record also shows that the U.S. command had considerable evidence that the Mahdi army had gotten the technology and the training on how to use it from Hezbollah rather than Iran. The command, operating under close White House supervision, chose to deny these facts in making the dramatic accusation that became the main rationale for the present aggressive U.S. stance toward Iran. Although the George W. Bush administration initially limited the accusation to the Quds Force, it has recently begun to assert that top officials of the Iranian regime are responsible for arms that are killing U.S. troops. Iranian Foreign Minister Manoucher Mottaki, at a news conference Sunday with his Turkish counterpart, accused the United States of backing Kurdish separatists waging warfare against Turkey and Iran. Turkey and Iran have been fighting guerrillas with the Kurdistan Workers Party, or PKK, and the Party for Free Life in Kurdistan, or PEJAK, holed up in the mountains of northern Iraq. "The patience of the Turkish government, parliament and nation has come to its end," Turkish Foreign Minister Ali Babacan said at the news conference here. Babacan thanked the Iranian government for its support but said he did not subscribe to the theory that Americans were backing the Kurdish rebels. "The U.S. does not seem to be involved in the PKK insurgence," he told reporters. But Mottaki called PKK, PEJAK and the Mujahedin Khalq organization terrorist groups and suggested the U.S. was supporting them. "We do hope that the U.S. administration will take corrective actions regarding clandestine and behind-the-curtain support for the terrorist activities," he told reporters. American officials report that the number of sectarian and other killings in Iraq has declined since the onset of the military "surge". But, while the number of killings may, indeed, have fallen, does that mean Iraq is really safer? Insecurity in Iraq is most strikingly illustrated by the number of people fleeing their homes. The United Nations estimates that, since July, the number has risen by 60,000 every month. The best estimate is that around 16% of Iraq's population, or one in six Iraqis, no longer live in their homes. Roughly half of those who have fled have also left the country, implying 2 million refugees. This leaves another two million who have been displaced internally, and who represent an emerging humanitarian tragedy. There have been international reports and fundraising campaigns to support Iraqi refugees in Syria and Jordan, but the internally displaced have received less attention, despite their greater vulnerability, owing to their proximity to the conflict and the poor standard of basic services in Iraq. They tend to be less visible, and it is more difficult for donors and agencies to assist them. Internal displacement predates the 2003 Iraq invasion. During Saddam Hussein's rule, large numbers of people were forcibly relocated through either conflict or government policy. Since 2003, displacement has affected all the peoples of Iraq, and the central reason remains the same - the use of violence to expel people from an area with the aim of increasing political and economic power. Mixed neighbourhoods across Iraq have been targeted by one side or another as sectarian violence has risen and local militias wield power. The inability of the government or the multi-national force to curb this intimidation reflects the absence of the rule of law. Other factors causing displacement include operations of the multinational force itself, crime, the lack of basic services, and desperate poverty. The complexity of Iraq's society and history means that many people have been displaced more than once, or have returned from exile only to become internally displaced. According to the UN, 69% of those displaced since February 2006 come from Baghdad, which demonstrates the extent of the "sectarianisation" of the capital. Thus, one reason for the "success" claimed by supporters of the military surge may well be that sectarian cleansing in Baghdad has been hugely effective and is now nearly complete. This month has seen the smallest number of Americans killed in Iraq than any other month since March 2006. But the reasons may have less to do with progress in the war than with the way we're now fighting it. Just 29 U.S. military personnel have died in Iraq in October so far-down from 65 in September, 84 in August, 78 in July, 101 in June â€¦ You get the picture: Fewer, in most cases far fewer, than half as many American soldiers have died this month than in any previous month all year. However, some perspective is warranted. First, all told, 2007 has been a horrible year for American lives lost in this war-832 to date, more than the 822 lost in all of 2006, and, by the time the year ends, almost certainly more than the 846 killed in 2005 or the 849 in 2004. So, what accounts for the decline in American deaths since the summer? It's hard to say for sure, but one little-reported cause is almost certainly a relative shift in U.S. tactics from fighting on the ground to bombing from the air. From January to September of this year, according to unclassified data, U.S. Air Force pilots in Iraq have flown 996 sorties that involved dropping munitions. By comparison, in all of 2006, they flew just 229 such sorties-one-quarter as many. In 2005, they flew 404; in 2004, they flew 285. The mother of a British soldier killed in Iraq holds Tony Blair responsible for her son's death as the inquest into his death resumes. Fusilier Gordon Gentle, 19, was killed on patrol in Basra on June 28, 2004. His mother Rose has blamed Army "neglect" for his death. Mrs. Gentle, a bitter critic of the war in Iraq, claims her son would be alive today if an electronic jamming device had been installed on his Land Rover. "There is someone responsible in the chain of command for not issuing this kit. Why didn't that person pass on this information and give the order to make sure it was fitted to the vehicles? Why have it sitting there if it is not fitted? There has been some kind of breakdown in the chain of command. This could have saved Gordon's life," Rose Gentle said. Quote of the day: "If they do it, it's terrorism, if we do it, it's fighting for freedom." - Anthony Quainton, U.S. Ambassador to Nicaragua, 1984: Anthony Quainton - Source: Off the record response of the Ambassador to a group of concerned U.S. citizens when asked to explain the difference between U.S. government actions in Nicaragua and the violence it condemns as terrorism elsewhere in the world.